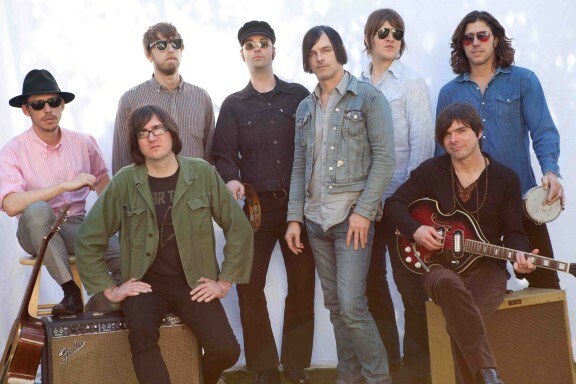 After waiting almost two years since their last tour, Adelaide fans were floored by American psychedelic / garage rockers The Brian Jonestown Massacre‘s performance at The Gov on Sunday night. Supported by Danish cult band The Ravonettes, fans were treated to two musical legends that sadly don’t tour Down Under all that often. At times sounding like a cross between 90s Britpop band Suede, 80s American Indie idols Galaxie 500 and the Jesus and Mary Chain (with their own style thrown into the mix), The Ravonettes played a tight set featuring many songs from their growing catalogue. Clear crowd favourites were the upbeat ‘Last Dance’ off their 2009 release In and Out of Control and the bass driven ‘Walk With You’ from Lust Lust Lust. These cult legends have a new EP, ‘Into The Night’ that’s ripe to be downloaded – definitely one to listen out for. The Gov filled to capacity as the guys from The Brian Jonestown Massacre ambled onto the stage. The band’s front line assembled in typical formation; Anton to the left of stage, alongside Matt, Joel and a host of percussion instruments, and finally Frankie ‘Teardrop’ Emerson who was seen taking a few sneaky swigs from a straight bottle of Jack during the show – old habits die hard. As with most of the gigs this tour, the set featured mostly old and new music with only a hint of the middle “experimental” stuff. Featuring ‘Paint it Black’ style lead guitar, the first song ‘Stairway To The Best Party’ off the latest album Aufheben was a great start to the night. This was followed up by the classic ‘Vacuum Boot’. The levels were just perfect and the guys played like few bands can. True to their collaborative style, Anton, Matt and Joel (who last gig only played handheld percussion with Bez-like devotion) all featured on vocals at different times. As expected, classic BJM tunes ‘Not If You Were The Last Dandy On Earth’, ‘That Girl Suicide’, ‘Servo’ and ‘Anenome’ were played and received the best reception from the crowd. Anton played half of the set on a vintage 12 string Vox teardrop guitar which had some kind of a technical issue and caused him to walk off the stage near the end of the night leaving the seven remaining members in a state of confusion. Many present held their breath but thankfully he returned and snapped at the band that they should ‘play something’ and the show went on. To the delight of all, BJT played for half an hour longer than programmed. If the Gov didn’t have a midnight noise curfew the feeling was they would have played well into the morning. The night was rounded off with an extended jam featuring plenty of guitars and an ample helping of feedback. After the other band members had left the stage Anton created some electronic, experimental music. The reception to this was about fifty-fifty with some of the crowd clearly enthralled and others looking like they were waiting it out. But all in all BJM gave a great show that showcased the best material from their almost twenty years of recording.